The low cost Series 673 Pressure Transmitter is a fixed range transmitter designed for harsh environments and suitable for high shock and vibration applications. Constructed of stainless steel, the Series 673 provides a 4 to 20 mA output signal with 0.25% accuracy. Use the Series 673 in industrial OEM equipment, hydraulic systems, HVAC equipment, industrial engines and compressor control. Series 673 base model has 2 feet of multicolor cable attached to make you electrical connection. 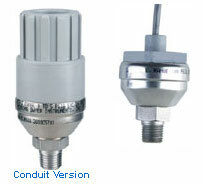 Series 673C is a conduit version. All of our Ranges in both Models.